This week I will be sharing sports themed activities and crafts...be sure to check back each day for a new activity or learning project! Today, I have a preschool football craft for you!! Making these little footballs takes just a moment to prepare, but our preschoolers were thrilled with their final product. Making a 3-dimensional craft is one of their favorite activities! Plus, it is excellent fine motor exercise! 1. Preparation: Cut football shapes (two at a time) out of the brown construction paper and punch holes around the football. Spacing the holes about an inch apart works well for young children. Cut a piece of yarn long enough to go around the football twice. 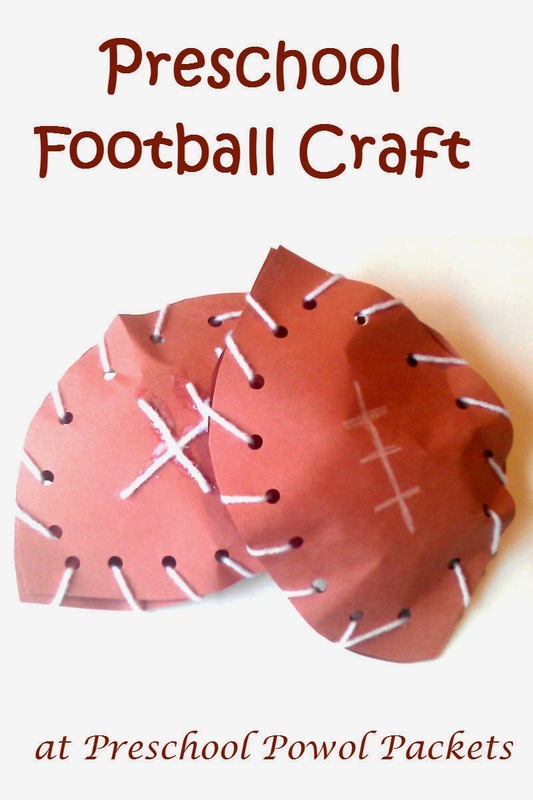 Place two footballs on top of each other so the holes overlap perfectly and tie one end of the yarn to one of the holes in the football. 2. 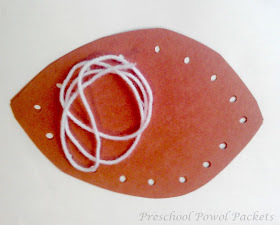 Let each child draw the stitch lines on the football with a white crayon. I had two children insist on gluing yarn to the football instead, but most loved drawing with the white crayons. 3. 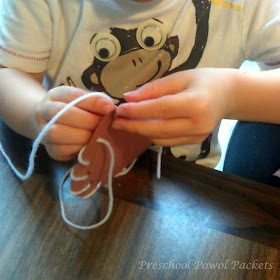 Show your children how to thread the yarn through the holes and let them get to work! Most of my 3-4 year olds took about 10-15 minutes to work around the football. One of them finished in about two and a half minutes! 4. 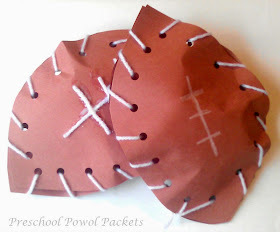 When each kiddo has about 4 holes left, let them "stuff" the football loosely with a couple paper towels. When they finish lacing, you can tie a final knot to secure their footballs. And now, let the games begin! Our crew started throwing the footballs the second their final knots were tied! Remember I will have more sports-themed activities, crafts, and learning projects all week...be sure to check back soon! UPDATE: Click here for an entire SPORTS theme!! It has activities, books, science, crafts, and more! I may share at any of these parties! Thank you for coming by! Comments make my day brighter!